Plain pizza at Zuppardi's in West Haven, Conn. 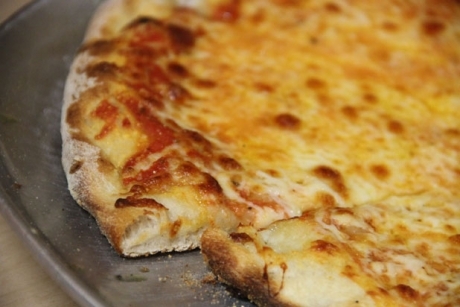 In the annals of Connecticut pizza, there's Colony for bar pies, Mystic, and — as outlined in any complete New Haven pizza primer — of course, the big four: Frank Pepe's, Sally's Apizza, Modern Apizza, and Bar and the Bru Room. (All together now: clam, tomato, bomb, mashed potato.) But there's another pizzeria on the other side of I-95. 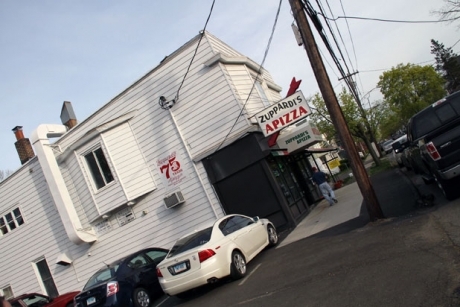 And this lesser-known pie spot in West Haven has been around for almost as long as the oldest of the others: Zuppardi's. 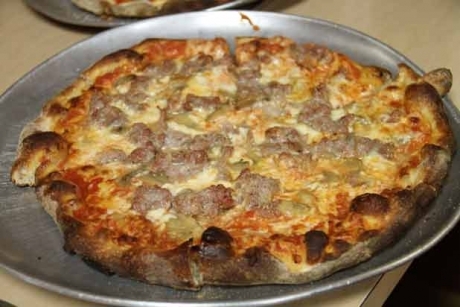 Don't be embarrassed if you've done the New Haven pizza tour but don't know Zuppardi's; this visit only happened after a conversation with a Connecticut pizza-lover while waiting on line in Phoenix for Pizzeria Bianco to open. 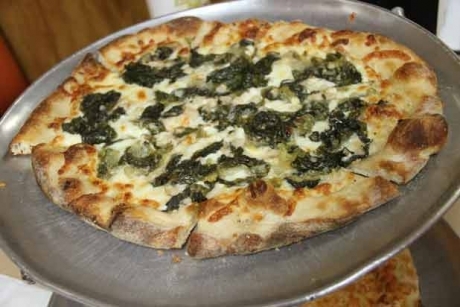 Like the other New Haven spots, Zuppardi's has its own take on Connecticut's renowned thin-crust style. Make no mistake, Zuppardi's is thin. Ignoring the cornicione, you have a crust that's probably about the same thickness as at the big four. The difference is just that, the edge. It's charred in places, and thicker all-round than the pies on the other side of the interestate — more like the thickness of a slice you'd find in New York City, but lighter. In fact, that may be the best way to describe Zuppardi's. 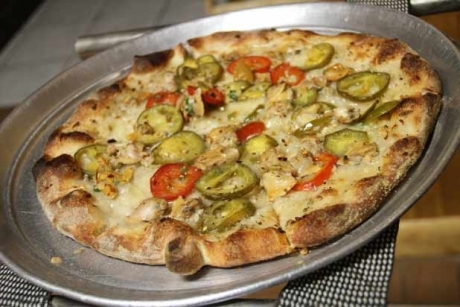 It's like a cross between New Haven and New York City pizza. As thin as, but less crisp than New Haven's other pies with a New York City crust that's lighter and airier than the ones you'll find in Gotham. Like the greats in New Haven, Zuppardi's also does a clam pie. Just be careful when ordering. As Roadfood.com notes, and wisely, Zuppardi's does two different clam pies. A fresh clam pie and a clam pie. The difference is market price, and freshly-shucked Little Necks. You may want to call ahead if you're getting the fresh one, and really, that's all you should be getting anyway — so call ahead. Fresh-shucked the clams are juicy and plump, tasty and garlicky, but not as good as Pepe's (and less Parmesan). The power move here? Bacon, of course, always (so too, no mutz, need it even be said? ), but also if you like a little bite, the cherry peppers. Be forewarned: they do overpower the clams. But the clam pie isn't really what you want. What's that? The "Special." It consists of mozzarella, mushrooms, and sausage. It's a red pie, and my oh my, that's some juicy sausage. Large, crumbled chunks of flayed open sausage glistening on cheese. Salty, juicy sausage with (admittedly, seemingly-canned, but-still-tasty mushrooms), mutz, and sauce? Not structurally sound, be sure to understand, but delicious. Here's the thing though, if you're here and you're not a local, most likely, you're the kind of person looking to really experience pizza in a way you're not used to. That move? The white escarole and bean pie. Crisp and wet escarole, garlic, smooth interspersed soft bean, wet and juicy. Crisp. Good Italians know that escarole and bean soup is a great winter savior. Here, you get that on a pie. Salud. Best Connecticut pie you've ever had? No. Truly New Haven-style? No. Better than Modern? Between the sausage and the escaraole and bean pies, you could make a strong argument, regardless.